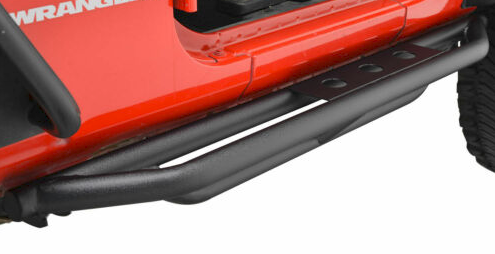 I am looking at tube side steps for my jeep. I found a couple that are similar in appearance but vary in price. Can anybody tell me what makes these similar products so far apart in price? I like the look of the Black Mountain lettering on the step as opposed to just the 3 holes from EAG but not enough to pay an extra $110. Any suggestions or other brands out there that y'all are using? I know you get what you pay for. Has anybody had experience with these two or any others? Alot could come into play. the coating could be better. thicker metals, better hardware. so on. Or it could just be the "fee" for the company name. It is usually safe to assume most these "budget" models are manufactured in China. BlackMountain is here on the outskirts of the DFW metroplex, but I not entirely sure if they are just importing or producing things locally with imported material (and I couldn't care less in regards to finding out really). That could account for some of the price difference (labor), but a lot of it is probably just they think their designs are better. Usually it just comes down to materials and finish. I would not say that the BM stuff is any better quality than Smittybilt or EAG, but that is just my opinion. All of those will dent pretty easily if you play in big rocks. I would not pay the extra $100 for the cut out name. EAG is a sponsor here. I can't recall if they offer a discount or not, but you might inquire if one of their products remains in the running. Long long ago, I had Smittybilt SRC rails similar to what you've pictured. They were perfectly fine for on road or light wheeling. None of them are real rock sliders or "armor" though. Just think of them as steps. I'm with resharp001 on this. If you plan to use them ONLY as steps, either works. If you expect to drag them across the rocks or have them protect your jeep from damage, I think you'll be disappointed.